NEW ORLEANS – It’s been a full month since the 2019 NCAA Division III Outdoor Track & Field season started and two weeks since the National Rating Index made its debut. 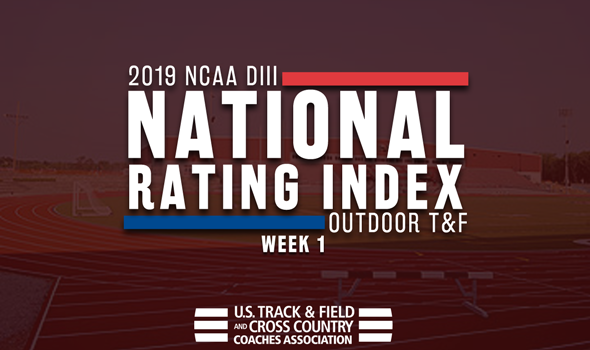 We saw a number of changes in the newest National Rating Index on both the men’s and women’s side as it was released on Tuesday by the U.S. Track & Field and Cross Country Coaches Association (USTFCCCA). Remember: The 2019 NCAA Division III Outdoor Track & Field Championships are set to begin May 23 through 25 at the SPIRE Institute in Geneva, Ohio. Dhruvil Patel helped North Central (Ill.) strengthen its billing atop the Men’s National Rating Index with his performance at the Stanford Invitational this past weekend. Patel, competing in the elite section of the 10,000, clocked the third fastest time in NCAA DIII history (28:50.87) and cemented his spot atop the TFRI Individual Rankings. He is also the top-ranked athlete in the 5000 and joins Peyton Piron as the only two Cardinals ranked in the top-5 individually (Piron is No. 2 in the 400H at 51.78, a time he ran at the 2017 CCIW Outdoor Championships). UW-La Crosse and Mount Union remained No. 2 and No. 3, respectively, following a few weeks of competition. Neither the Eagles nor the Purple Raiders turned in marks that changed the TFRI Individual Rankings and in turn, the National Rating Index. Rowan climbed the National Rating Index to No. 4 thanks to a trio of strong efforts this past weekend at the UCF Invitational. The Profs saw their 4×100 relay team notch the No. 2 time in NCAA DIII this season (41.27), Tyler Garland move up to No. 4 in the TFRI Individual Rankings in the 110H (14.30) and their 4×400 relay take over the No. 5 spot nationally (3:18.23). This is the 19th time in the past three years that Rowan has been ranked in the top-5 nationally. Pomona-Pitzer remained steady at No. 5 after a strong start to the season for Carter Floyd and Daniel Rosen. Floyd is ranked No. 3 in the TFRI Individual Rankings in the 1500 at 3:49.09, while Rosen joined him in that ranking in the steeplechase after his 9:04.54 effort at the Bob Larsen Distance Carnival this past weekend. The rest of the top-10 includes No. 6 UW-Eau Claire, No. 7 Redlands, No. 8 Washington (Mo. ), No. 9 John Carroll and No. 10 Haverford. George Fox is ranked No. 1 for the second time in program history. The Bruins held down the top spot for one week in 2018 before settling into other spots in the top-5. It has been a banner season for GFU already as Annie Wright put up the third most points in the heptathlon in NCAA DIII history (5307) and its 4×100 and 4×400 relay teams are both ranked first nationally. Williams jumped seven spots between the preseason and Week 1. The Ephs were No. 9 in the first edition of the National Rating Index and come in at No. 2 in the second installment. Just like the Bruins, Williams was helped by a heptathlete and its relay teams. Caitlin Ubl is ranked No. 3 in the TFRI Individual Rankings thanks to her 4949-point total at the UC Riverside Spring Track Classic, while the Ephs’ 4×400 and 4×100 are ranked second and fourth, respectively. Washington (Mo.) is up to No. 3 after Sophie Watterson stood out at the WashU Distance Carnival this past weekend. Watterson clocked a time of 35:52.43 in the 10,000, which put her No. 7 in the TFRI Individual Rankings in that event. This is the first time that the Bears have been ranked in the top-5 since the 2017 season. Johns Hopkins fell three spots from No. 1 to No. 4, while Redlands dropped one spot from No. 4 to No. 5. It has been a big season for the Bulldogs so far, as their 4×100 relay team is No. 2 in the nation and Chyenne Kimble moved up to No. 4 in the TFRI Individual Rankings of the 110H (14.19) after the SCIAC Multi-Dual Series. The rest of the top-10 includes No. 6 Occidental, No. 7 Emory, No. 8 UW-Eau Claire, No. 9 Nebraska Wesleyan and No. 10 Dubuque.